This is a vital subject for anyone wishing to work with the public. Effective consultations involve far more than simply telling a client what their colour choices mean. Consultations are the art of supporting clients to come to their own truth. This course gives you the skills to be truly helpful to others. It is entirely focused on the Aura-Soma consultation process. 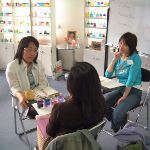 It has grown out of twenty years of experience working, consulting and teaching with Aura-Soma. Its aim is entirely practical: to give you the real skills, confidence and ability to meet clients and support their process through Aura-Soma. This course is perfect if you would like to develop your consultation skills, if you would like to increase your confidence in your abilities, or if you would like to recognise and understand the Aura-Soma consultation process better. It is equally useful for those already offering consultations or for those wanting to start. The course’s success is based on some unique features. Firstly it presents a truly helpful consultation model by which any individual consultation may be understood. This model is not available on any other course. Secondly this course shows you real consultations being given. This is significantly different from the “for instances” given to demonstrate a specific topic of input as generally happens through the Aura-Soma Training Levels 1 – 3. Actually seeing real consultations is a great way to learn; it is the difference between learning in theory and learning in practice. Thirdly this course is full of student activity sessions, many of which are original to this course and all of which are designed with one goal in mind, to provide you with personal experience of employing effective consultation skills. By the end of the course you will have the confidence of having already practiced what you wish to offer the public. You will be more relaxed, confident and open. Your clients will be more fulfilled and genuinely inspired. You will learn even more about your client, about the potential of Aura-Soma, and about yourself in each session. Each consultation will become a wonder, an adventure, a learning experience. Consultations will become less tiring as you flow with the client rather than trying to do something to or for them. Your practice will grow. ASIACT accredited Continuing Education course. Attendance of all or part of this course will allow you to renew your Practising Certificate. Although a certificate is issued only on completion of the full 36 hours, nevertheless this course is added to your student record on the ASIACT database once you have attended minimum 18 hours.